Finding the right hair products can be similar to playing roulette, and the cost of trying to figure out what works well for you can become very expensive, very quickly. 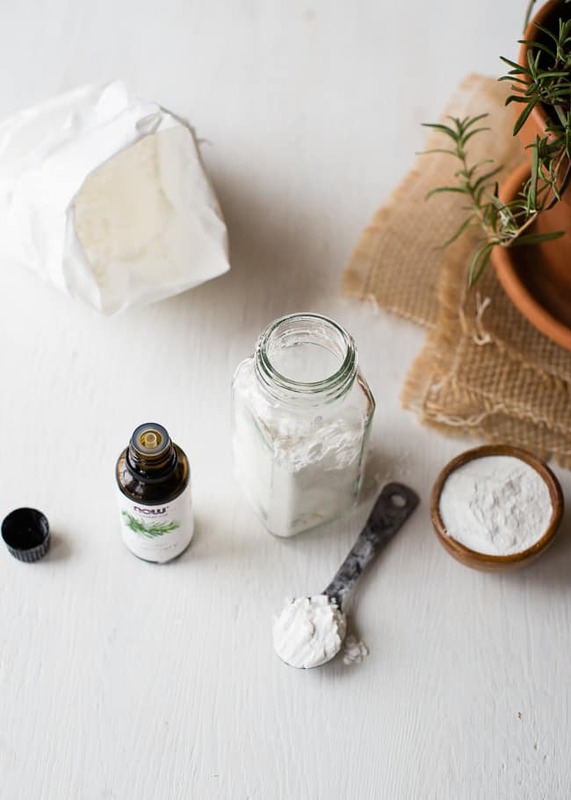 Making your own hair products is easier than you’d expect, not to mention you get to control the number of chemicals in them, ideally zero! Rosemary oil is a fantastic ingredient to use in hair products because it not only helps with dry, flaky scalp, but also stimulates hair follicles, encouraging hair growth and strengthening hair shafts. Try these natural rosemary infused hair treatments for a little extra volume and to treat dry, frizzy hair. 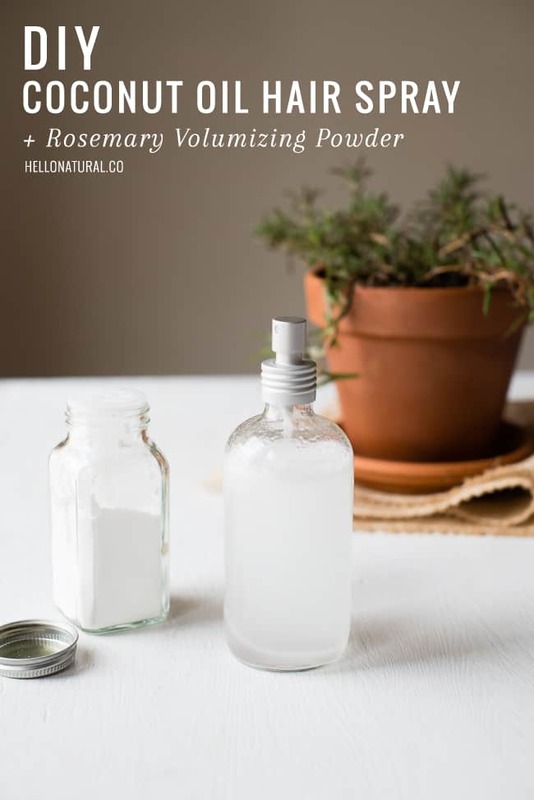 A fun tip is to actually apply the volumizing powder right before bed, and when you wake up you’ll have extra height to your hair that also smells divine. In a mixing bowl, combine the corn starch and rice flour (potato flour works fine as a substitute) and add the 3-4 rosemary oil drops. Add the mixture to an empty spice shaker and sprinkle on to your roots for extra volume. Hair spray has come a long way from the aerosol cans that made us cough and simultaneously worry about our contribution to the hole in the ozone layer. This hair spray will hydrate and actually strengthen your hair as opposed to most hair sprays on the market. Don’t expect the strong hold of alcohol-laden hair sprays, but instead you’ll see the frizz fade away after using this natural alternative. 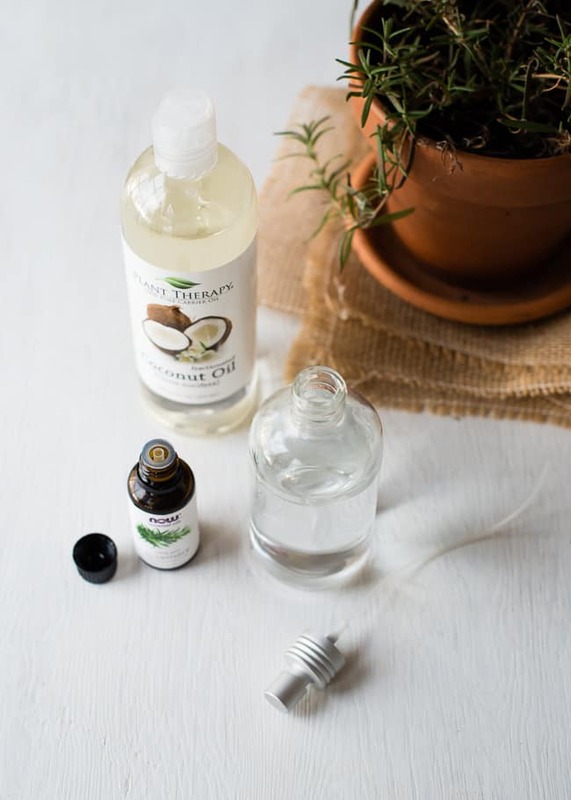 Melt the coconut oil and add to a spray bottle along with the distilled water and essential oil. Be sure to shake well before each use, separation is normal. Spritz on damp or dry hair. I think this is the best and suitable recipe for me. Coconut is necessary for my hair. Thanks for the amazing recipe for my hair. I hope this will work on my dry hairs. Where do you find rosemary essential oil? Any natural food store should carry Rosemary Essential Oil. Do you think it will need no preservative? How long will its shelf life? Hello! I was wondering if I could use an essential oil other then rosemary? like peppermint or lavender. thanks! Did you use fractionated coconut oil or regular? If you didn’t use fractionated, do you think it would work and avoid the re-hardening problem? Hey Elizabeth – we used fractionated coconut oil. I think in the summer or if you live someplace warm, it wouldn’t be a problem using regular so it doesn’t harden. I do Love coconut oil for the hair, and just about everything else. I just want to mention that if the coconut oil get cold it will harden and won’t spray on. So just run the bottle under hot water before you use it in the cold months. I do this with my coconut oil make up remover. Thank you for sharing so many good things. Merry Christmas. I completely agree! Such a versatile ingredient. Thank you for sharing.